Menus are crucial for allowing customers to strategically and efficiently navigate ecommerce websites. A well designed menu can encourage or discourage customers from continuing with their searches on your site. The Animated Mega Menus functionality shows shoppers more of what they can expect from sections and tabs listed on your website’s menu. This functionality is perfect for online businesses that are looking to make their menus more appealing for visitors to their websites. 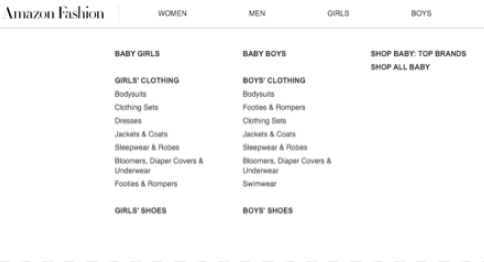 The Animated Mega Menu functionality displays animated images inside the mega menu on an ecommerce website. The eye-catching images capture customers’ attention and directs them to products and categories that are most likely to convert. The functionality also improves the design and usability of ecommerce websites by presenting a highly functional and attractive menu to customers. The Animated Mega Menu functionality simply improves customers’ experiences on ecommerce websites. Customers know what to expect from specific sections before they click any links and this allows them to get a good idea of what kind of products to expect. This functionality makes shopping more efficient for consumers and increases conversions by helping customers get to the pages they want to get to. To increase conversions and keep customers coming back it’s important to make websites as easy to navigate as possible. The Animated Mega Menu functionality does just this and without it your website has a mega menu just like any other ecommerce store. The Animated Mega Menu functionality can be yours today. Call Optimum7 or fill out our online contact form to learn more about this functionality.